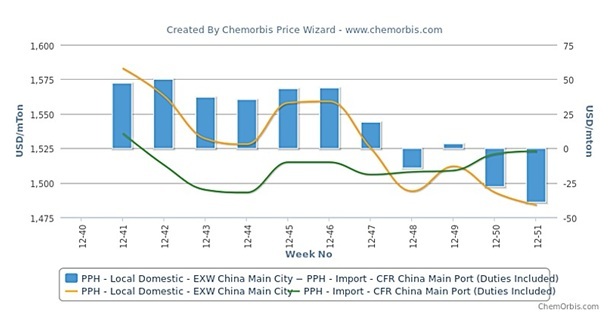 It was the last week of November, when the domestic PP market in China first lost its premium over imports, as per the pricing service of ChemOrbis. After a slight recovery in the first week of December, domestic PP prices have turned down again in the past two weeks while import prices have recently stabilized at the slightly firmer levels reported in the first half of the month. 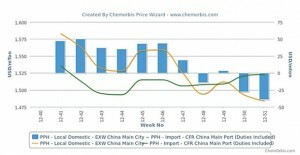 As can be seen from the graph below created by ChemOrbis Price Wizard, this situation has caused the domestic Chinese market to trade with a discount of $40/ton this week when compared to the import market on average even after including applicable customs duties, it rises to around $70/ton when adding estimated clearing and handling charges. When looking at the import market, a South Korean producer is offering stable prices to China this week. “Demand is not great as buyers prefer local cargoes due to their more competitive prices. The year-end slowdown is also putting a cap on demand,” a company source commented. He also thinks that PP prices may remain stable until the end of the year. A Xiamen based trader sounded pessimistic about the expectations regarding better economic conditions. “We don’t expect to see encouraging demand soon. The PP market may remain stable until the year end while the outlook for January may be stable too,” he commented. Now that the local PP market continues to offer more competitive prices than imports, this is expected to result in a limited number of deals in the import market for the near term, according to many players’ opinion in China.